On Friday my friend in I visited Holmens Kanal a new cocktail bar in the center of Copenhagen. I've had plenty of time since to write this review but every time I start I stop. The reason is simple: I'm conflicted about this bar. It is certainly a very nice room: Dark wood, a generous bar, leather booths and elegant art deco wallpaper. But it's also a cliché. This is Copenhaven 2014 not New York in the 1920'ies. 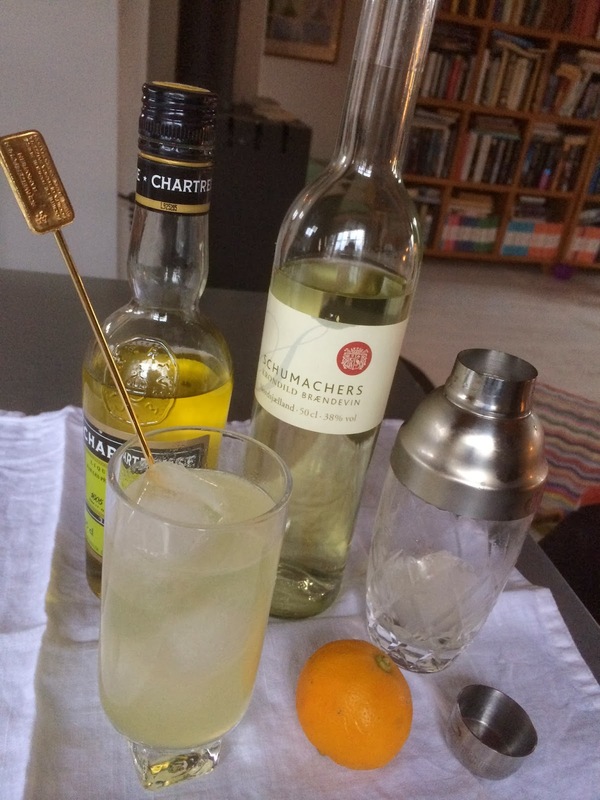 I'm well aware that there are many people new to cocktails who will be attracted to the classic speakeasy look, but I long for the day that a new bar in Copenhagen looks like a new restaurant in Copenhagen - or even as avant garde as the new closed Gamsei in Munich in Germany. Holmens Kanal is run by the people who own Salon 39 and Gilt - and since I like both of those bars very much I had high expectations. Fortunately the cocktail menu is not dogmatic speakeasy as opposed to the decor. I ordered a Mai Tai and almost ran out of there when it was served. 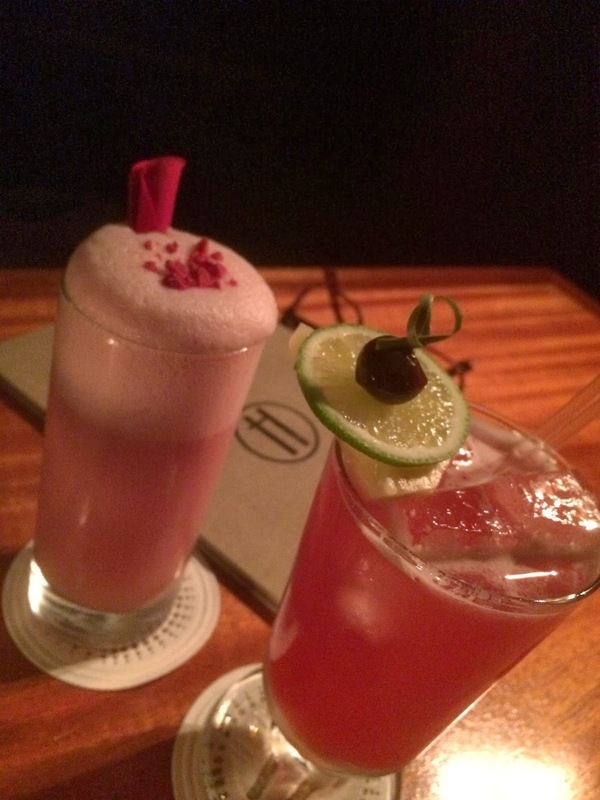 It was pink - very pink as the photo proves - it's the Mai Tai on the right. And nothing say's I don't know my classics as a pink Mai Tai. The true color is yellow-green-brownish. Which shows me as a huge hypocrite: On one hand I find the decor too traditional and on the other hand the cocktails not traditional enough. 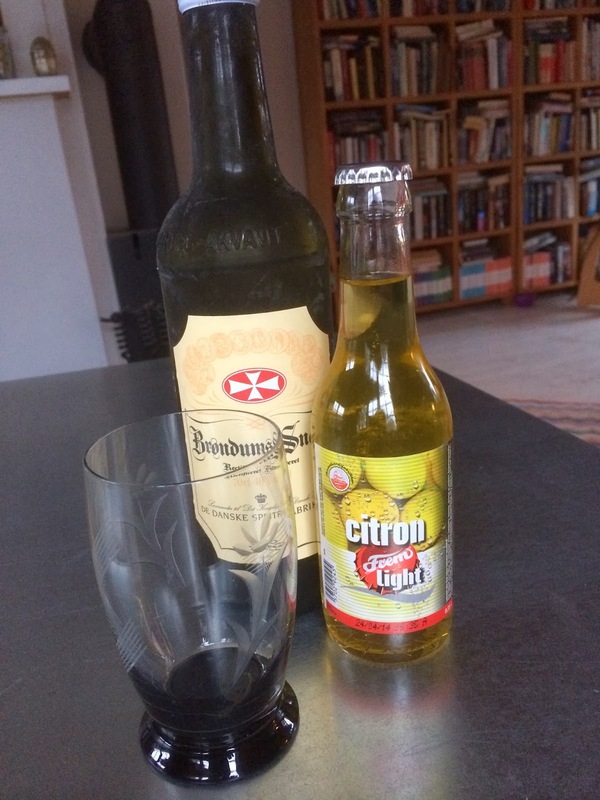 It did however taste absolutely spot on: Tart, sweet, almondy and of good rum. My next to drinks where a completely simple Remember the Maine and a Pusser's Painkiller. The latter disappointed my friend more than it did me - she found it a bit watery. Taking the price - about DDK 100 a drink which is not very expensive to a Dane in Copenhagen - into account it was some very nice cocktails. But my visit to Holmens Kanal ran into the no longer existing canal the street is named after the moment the bar, which is housed in the ground floor of the oldest department store in Copenhagen, asked me to hand over my credit card as we ordered out second round. And considering how many people Holmens Kanal employs including a hostess who seats you and tell you goodbye as you leave I refuse to believe that many people manage to run out on their bill. And considering that we could leave Holmens Kanal and walk into a nearby very busy steakhouse and "start" a much larger bill without handing over a credit card the praxis seems all the more absurd. As we left I asked what I could do to avoid this praxis during our next visit, and was told: Nothing. Which simply means there will be no next visit.